We invite you now to be our guest and check out these 25 fun facts about Beauty and the Beast. The first ever recorded version of the story of Beauty and the Beast was in 1550 by Giovanni Straparola. A retelling of the story, by Madam Le Prince De Beaumont, was later published in 1756 and became the most famous version. Over the years, Disney story artists created several versions of the storyline. In a 1983 treatment, Belle was aided by forest animals instead of animated castle objects, and in a 1988 version, a script arose wherein Belle had two sisters. Practice makes perfect. The prologue was rewritten 200 times. One song that didn’t make it into the original version of the film was “Human Again,” wherein the household objects sing of their imminent hope to be returned to their human forms. Lyricist Howard Ashman and composer Alan Menken were nervous the filmmakers wouldn’t like their opening number, “Belle,” which was done in a light operetta style. They needn’t have worried; it was exactly what the filmmakers were looking for. The film, directed by Gary Trousdale and Kirk Wise and produced by Don Hahn, made cinematic history by becoming the first animated movie to be nominated for an Academy Award® in the Best Picture category. Angela Lansbury (voice of Mrs. Potts) recorded “Beauty and the Beast” in one take! “Something There,” in which Belle and the Beast begin to grow fonder of one another, is the only time we get to hear the Beast sing. Beauty and the Beast was made in two years, a relatively short amount of time considering the average production time for an animated movie is three to four years. “Belle” went on to be nominated for Best Original Song, along with “Be Our Guest” and “Beauty and the Beast,” which won the Academy Award. The Beast’s look and movements are based on more than six animals including: lion, buffalo, gorilla, wild boar, bear and wolf. The animators took lots of trips to the zoo! More than 100 actors auditioned for the part of the Beast before the filmmakers chose Robby Benson. “You could hear the man beneath the fur,” said the filmmakers. Originally, Maurice was modeled after American Actor, Jack Lemmon. Easter Egg #2: When Maurice gets lost in the forest, and reaches a fork in the road, the signpost includes the town names Burbank (home of the Walt Disney Company’s headquarters); Anaheim (home of the Disneyland® Resort); and Valencia (home of one of the background artists). 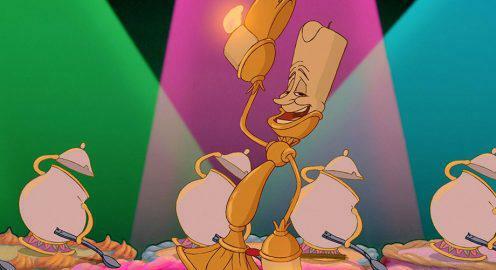 “Be Our Guest” was originally sung to Maurice when he arrives at the castle but filmmakers realized it should be sung to the leading lady, Belle, and moved it to the dining room scene. Easter Egg #3: Keep an eye on the bearskin rug during the “Gaston (Reprise)” song. It starts out by the fire, then by the end of the song has somehow mysteriously moved under Gaston’s chair. 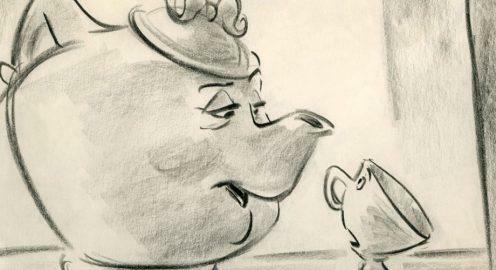 Angela Lansbury was always at the top of a short list to voice Mrs. Potts because of her natural warmth and sincerity. The motherly teapot had a lot of different names like Mrs. Chamomile and Mrs. Darjeeling before the filmmakers landed on simply, Mrs. Potts. Mrs. Potts’ son, Chip, originally had only one line in the movie, but after Bradley Pierce was cast as the voice of Chip, the filmmakers thought he was so cute and funny that more lines were written for him. The enchanted members of Beast’s household staff (romantic Lumiere, pompous Cogsworth, refined Mrs. Potts and others) cannot be traced back to the age-old fairy tale from which the film was based. The charming sidekicks were added during the production of the film. In the beautiful ballroom scene, Belle and the Beast were drawn in traditional 2D animation, while the background was a 3D computer-generated environment, a technique considered revolutionary in 1991. Easter Egg #4: Does the final dance sequence look familiar? Due to lack of time, that dance scene animation was “borrowed” from Sleeping Beauty – animators cleaned it up and turned it into Belle and the Prince! The filmmakers received a request to show the film at the New York Film Festival. Only one problem: the movie was not complete yet. They agreed to the showing but worried that no one would want to see a half-done film with pencil tests and storyboards. Boy, were they wrong. The festival crowd loved it, and gave a standing O!